Christmas discs can be a hit and miss affair, so I count myself lucky to have reviewed a number of very good ones recently. Programming is particularly important, so a smattering of unusual pieces and unfamiliar composers – as here – is a good sign. That said, I’m always wary of organ duets, which tend to sound overblown at the best of times. 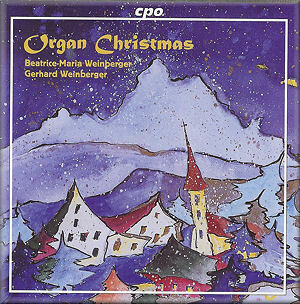 As for the organists, the husband and wife team of Gerhard and Beatrice- Maria Weinberger, they are entirely new to me, as is the organ they play. More familiar are CPO, who have produced some fine organ discs in the past, among them an excellent Duruflé collection (CPO 777 042-2). The first duet is the Handel Prelude and Fugue in C, attributed to John Marsh (1742-1828). It’s a routine rendition of an unremarkable piece, made even worse by a distant, bloated organ sound. Fine detail and that elusive sense of presence are sorely lacking here, but that wouldn’t matter so much if the playing weren’t so prosaic. Not a good start, I fear, and the murky opening to Giovanni Morandi’s Pastorale in F is no better. A more stolid performance of this piece would be hard to imagine. Even the music’s more rhythmic passages lack buoyancy and bounce, blighted as they are by very poor articulation. Despite an imperious opening, the four-handed, four-footed set of variations by Julius Schneider is every bit as turgid as I expected it to be. Luther’s chorale ‘Vom himmel hoch’, on which these three variations are based, is an uplifting Christmas favourite, yet even in its vigorous fugal finale this piece remains stubbornly earthbound. When the playing is as parochial as this, the organ so limited in tonal range and subtlety, and the recording way below par, the results are spectacularly awful. Even Gerhard Weinberger can’t revive the patient, his rendition of Widor’s homage to Bach devoid of Gallic charm. He does find a pulse of sorts in the Dubois, but then it’s all but snuffed out by lacklustre playing and that terribly drab organ sound. With Beatrice-Maria Weinberger in the saddle I had hoped this disc could be taken off the critical list. Sadly, there’s no saving the overweight, overlong Lehrndorfer piece either, despite some mobile writing and an ebullient finale (tr. 18). Mrs Weinberger’s solo playing is a little more relaxed than her husband’s, but given there’s so much wrong with this recording that’s not saying very much. Ever hopeful, I waded through Ralf Bolting’s duets based on O Come All Ye Faithful and The First Nowell (trs. 19-20). At last there’s a hint of festive fun in the sprightly opening to the first carol – even if it peters out rather suddenly – and while the second is suitably grand at the outset it soon becomes raucous and overbearing. As if that weren’t enough, the playing is slapdash from start to finish. And to think this is a Christmas disc, ostensibly designed to lighten the heart and lift the spirits. Even the booklet seems dull and uninspired, with precious little detail on the works and composers featured. In three years of reviewing for MusicWeb International I’ve only come across a handful of turkeys. This is one of them.